Good afternoon! How are you all enjoying the bank holiday weekend? The weather has been a bit unpredictable but hopefully the sun has shined for part of it! 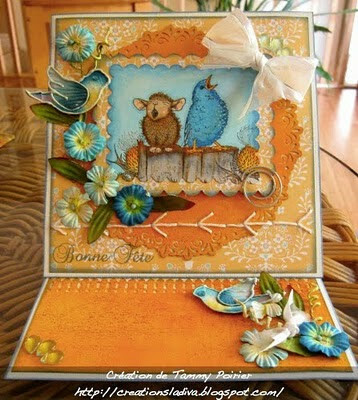 Thank You for your great entries to our spotlight on the spotlight technique especally those having a crack at it for the first time, easy isnt it! I shall be back with a winner later on and our winners for the birthday challenge as I'll probably be out today! A bottle of dazzling diamonds glimmer mist - This gives an excellent clear sparkle finish to your cards. A sakura stardust pen in clear - Great for adding highlights and is VERY sparkly! A quickie glue pen - Use this to add loose glitters or glamour dust when the glue is blue or let t dry clear and add foils, fab tool! The team have had some fun with this so I'll hand over to them to show their sparkly creations! I used the colors Black,white,and red. I loved the mirror in the video, so that's how I came up with the shape. The black card front was scored on a diagonal in both directions and the I rubbed white pigment it across to make it pop. This pattern reminded me of the wire mess. Of course we have rhinestones, metal, and lots of pearl glimmer mist(hard to see) . I couldn't stop with the card front. So many things inspired me when I watched the video (for the first time for this challenge, as a matter of fact-lol). I chose the colors red, white & black. I made a shaped easle card. What you see here is some wire mesh with glitter underneath, a silver doily with a fabricky flower on top of it. Red lacy ribbon accents the center of both the top & bottom aspects of the easle. Eye Candy bling can be seen on the top & clear embossed stamped images are on the bottom (can't really see) beside the sentiment that says "The world is but a canvas to the imagaination". Underneath the easle are more goodies such as a silver doily homemeade flower, more mesh, more glitter & a couple roses (stems seen here with ribbon tied around them). What I took from the Lady GaGa video was white, silver, a hint of red, and lots of shiny! I did a four part backing using two pieces of silver/transparent gauze-type material I bought a while ago, and two bits of silver - one holographic and one embossed. To this, I added some Prima flowers which have been edged in either silver or red glitter and finished with some jewelled brads I've been hoarding for a few years. Finally, I added some Wild Orchid Crafts flowers, another from Hobbycraft and some swirls I cut with my new Spellbinders swirls die set. 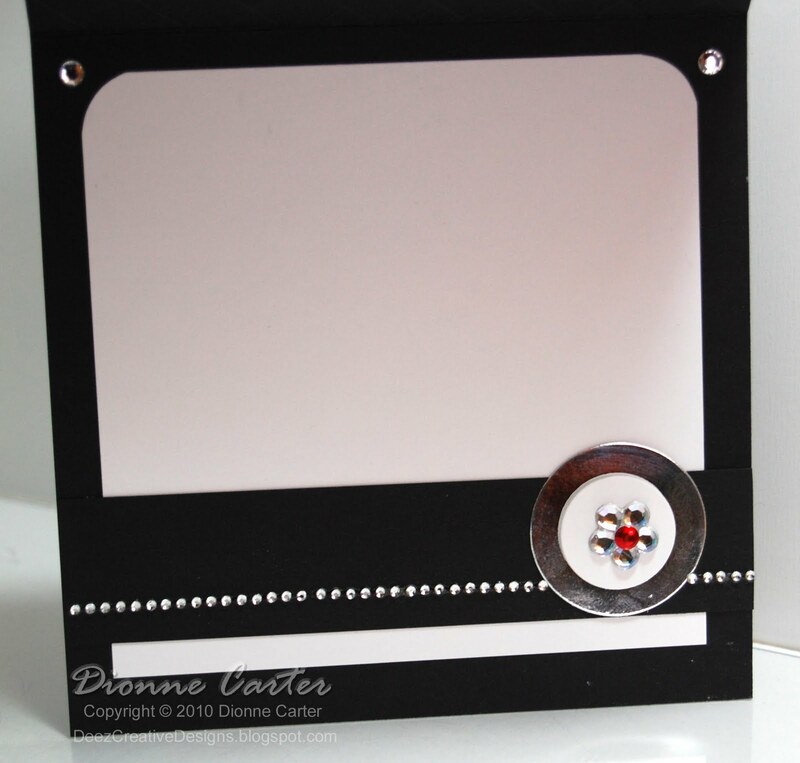 When I viewed the video, I got the inspiration to a black and silver card. I love glitter, so it had to have lots and lots of glitz. The image is Ballerina Tilda, stamped in memento black ink and then coloured in with copic's. The dress is coloured with silver and black glitter. I use the same glitter on the shoes and tiara. I added stickles to the base and ribbon on the shoes and also on the tiara. I cut 3 scalloped ovals using nesties from black card and Miri board. These I edged them with the same glitters. I layered some miri board on top of some black card. I added a strip of black card and some silver ric rac. I created a black flower edged with silver glitter and stickles. I cut some leaves from same card. I created some coordinating embellishment pins, which contain wooden beads that I have covered with the same glitter. These I arranged with the flower on the corner of the card. I have called this card "Lady Maga"! I've taken my inspiration from the colours white and silver with a touch of red. I embossed some silver card with the Cuttlebug Holly Ribbons folder and some white with the Swiss Dots folder. I edged the white with silver Stickles. 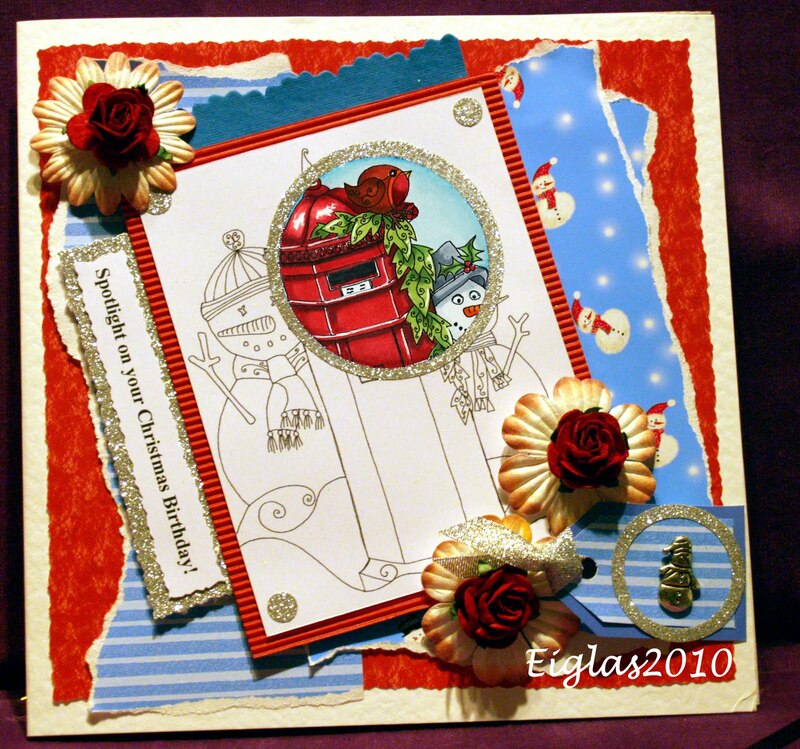 The large snowflake is cut with a Sizzix die using silver card and white glitter card. The small snowflakes are punched. The sentiment is from Craftwork Cards and I edged it with a Sakura glitter gel pen. I added some red jewels, white organza ribbon, silver string and a red button from my stash. Who can resist a bit of Glitz n' Bling!! 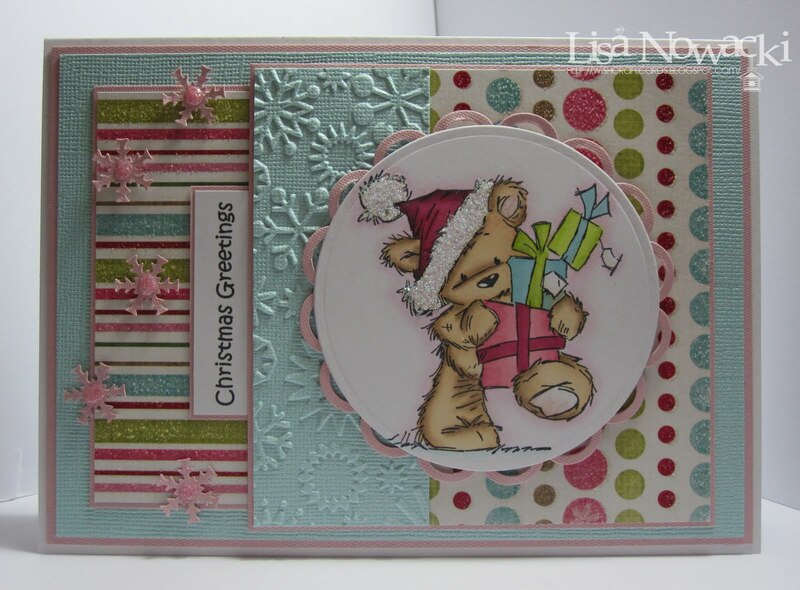 The digi is Stars from Mo Manning coloured with a mixture of pink & purple ProMarkers & silver glitter Sakuras. Bronte (The Dog) has been decoupaged. Mounted onto some Bazzill Bling card with backing paper & a strip of ribbon from the Laura Ashley Traditional collection with silver Stickles Glitter Glue highlights & silver gem stars. Don't we all just love sparkle? I just couldn't wait to get out my glitter and gloss and get messy!I used my new magnolia stamp that my hubby got me with the fab new Prima papers, sanded the edges added loads of glitter to both the paper and image. Coloured with promarkers and finished with gloss on the leaves, gems and ribbon from stash. I have used Her Handbag and The Shoe images from Sketching Stamper, I love these images - I think they look so glamourous :o), and coloured them with Promarkers and just a little(!) of Champagne coloured Stickles, I also used Glossy Accents on the jewel clasp on the front of the bag. I then edged the white card with a small toning inkpad, cut around the shoe and used foam pads to stick it in front of the handbag. 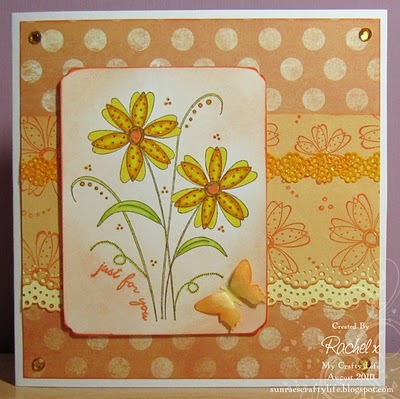 My backing papers are from the aptly named All Dressed Up stack from DCWV and as they were already glittered they seemed perfect for this card. 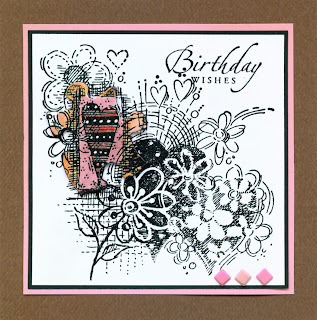 The sentiment is an old Stampin Up one and the oval and scalloped oval are cut with Stampin Up punches. The flowers are Prima and the centre is a small punched circle cut from the left over DP and covered with Glossy Accents. 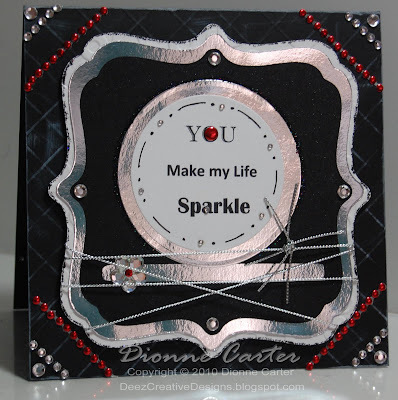 I used a tall card with a pink glitter border, then added a black evening dress on it's hanger, a pair of shoes, gloves, a necklace, two different hats & handbags plus a ring, they are all in black & have silver glitter outlines & features. 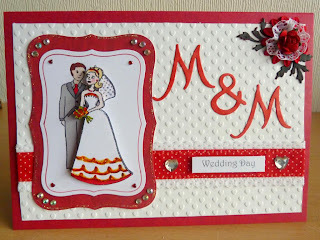 Finally, I added a thin line of red glitter glue round the edges of the card between the glitter border & the area with the clothes etc. I've used a Lily of the Valley stamp, coloured with promarkers, with added shading using Koh-i-noor pencils blended with sansador. I've added sparkle to the image with glamour dust. The papers are My Minds Eye and are covered in glitter, the pink and blue cardstock is shimmery. I embossed a panel of the blue cardstock with a cuttlebug snowflake embossing folder, added a computer generated sentiment and some little punched snowflakes with pink stickles in the centres. Sparkle overload!! Please add your entries to the froggy link below. Challenge closes at 9am on Monday 13th September. Maximum of 3 entries, no backlinking and please follow the challenge set of glitter & sparkles. Thank You! Good afternoon all! Thank You for helping us celebrate our first birthday with your fantastic entries! We'll be back soon with the winner of that and Melly's Top 5 when we've finished our rounds, I think everyone is run off their feet with the school holidays lately! Thank You once again to Joanna Sheen for sponsoring us! A couple of announcements that our teamie Judie has decided to step down from the team due to family commitments and working on her new online shop. Thanks for all the creatons Judie, we'll really miss your crazy self and good luck with everything! Also we are now on facebook so hope you can 'like' us there and ask any questions you may have! 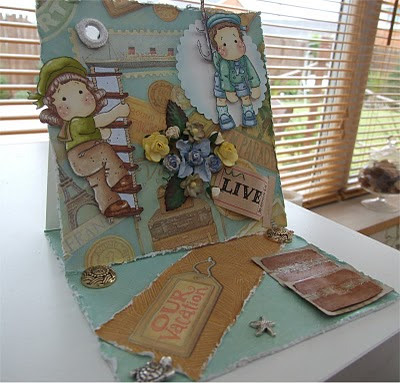 Time for a walk on the wild side and a bit of fun at Crafty Cardmakers! I'm often asked as I'm sure a lot of you are "Where do you get inspiration?" Well a source I use often is Music & Video - they can spark off a lot of ideas when the mojo has taken a hike! I haven't seen a video inspiration challenge before and we do like to try new things here so I've chosen Lady Gaga's Bad Romance video plus its been viewed over 250 millon times on you tube so can't be that bad! I've given you some help along the way too! The challenge is to base your creation on things you pick out from the video (or the still photos here) The video can be found here on You Tube (There is a copy of it posted further up here too). It could be a colour choice, shoes, fashion, lyrics, metallics, lots there so be creative. 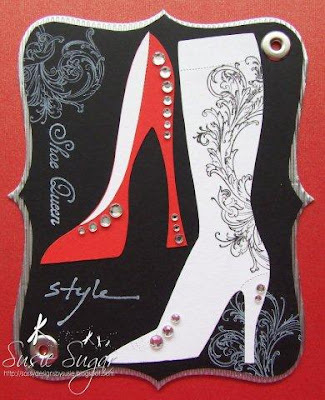 When I watched the video and saw shoes I immediately thought of Susie Sugar at Die Cut Dreams with her gorgeous shoe die cuts. She's a great sport and is sponsoring us with a fabulous prize of approx £10 worth of die cuts, photo below shows a selection of them. Thank You Susie! 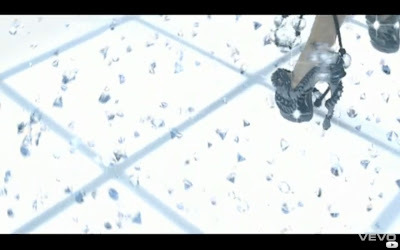 A still from the video showing shoes! 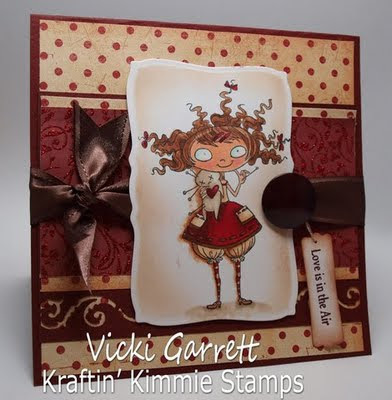 Vicki Garrett designer for Kraftin Kimmie stamps has also let me borrow one of her fab creations using one of the Drucilla stamps which when I saw Lady Gaga's hair I immediately thought of this stamp range. And over to our regular team to strut their stuff, thanks girls what a fab job you did! I focused on the red part of the video too but also drew inspiration from the bit where she seems to be auctioned off, hence the chain in my image. 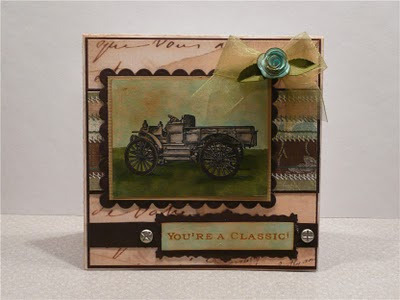 Again I used a KennyK digistamp as they are edgy like Lady G herself. I coloured it with a combination of promarkers, prismas, and digitally! Couldn't get the shade of red I wanted with either of the others so I reprinted the stamp with the skirt already coloured on the pc, but the rest I coloured myself. I knew there was a reason I hated red, so difficult to match colours. The red punched part represents the mesh on her silver outfit. Didn't even try to colour it in with all silver! BPs from my stash, shrink plastic corset, swirls courtesy of Marianne Creatables. 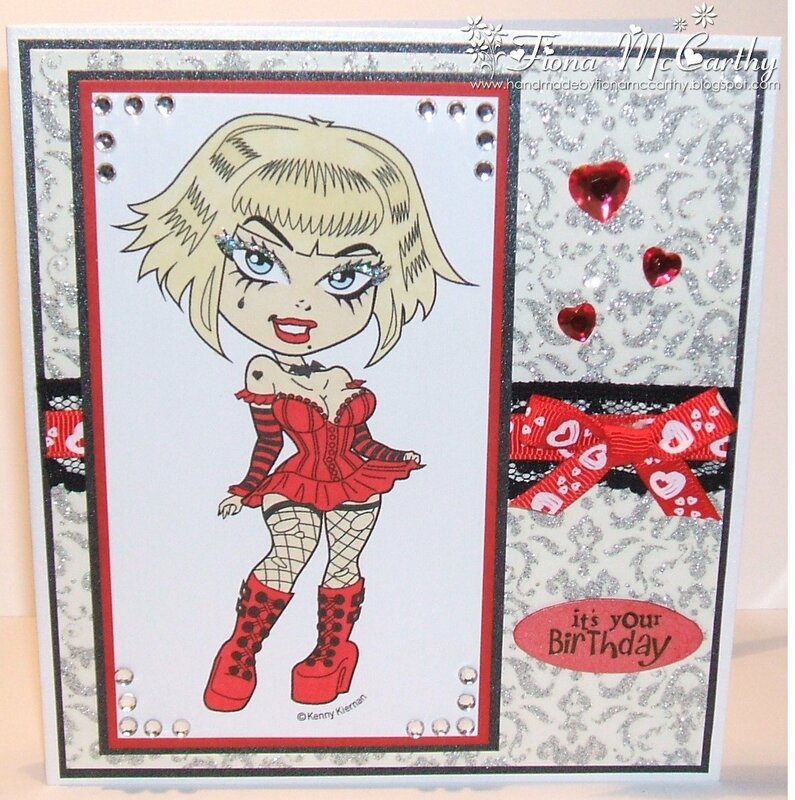 For this challenge I picked out the black and diamonds and kept being drawn to the Red Hearts stamp by sweet pea. I've applied glitter around the papers and image, her glove and wings with lots of sparkly sticky gems and some tiny nail gems on her bodice and bracelet. I gave the card a final spray of dazzling diamonds glimmer mist. So much inspiration could be found in this video, I chose the colours black, red and silver. I chose the digi image from Kenny K and had no problems colouring it with promarkers (apart from my first attempt covered her up a little too much !) 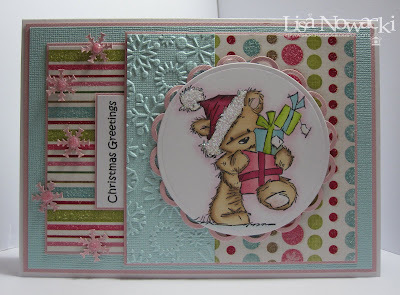 , the struggle was to make the card, I stuck to basics, matting layering, stamping and stickers with a few gems. I liked the bit where she was looking in the mirror, so I've used a silver metal frame with a face, stamped in Brilliance Starlite Silver on glossy card. The Harlequin background (diamonds) is embossed in silver and white glitter Embossing powder and the silver mesh is attached by brads (more diamonds) and double sided tape, behind the frame. The background and word are layered on silver mirror card. What a great video, I got so many ideas from this. I decided to go with White and Silver for my card cos they are favourites of mine. And of course I had to have a bit of bling! The word at the side represents the theme of the song and the crown on the top I got from those lovely crowns the dancers were wearing. I would have liked to have used PVC but didn't have any so tripple-embossed the letters instead. Full details of what I used are on my blog. For my card inspired by the Lady Gaga video "Bad Romance" I focused mainly on her red lace clothes in one part of the video and all the lovely bling in the video. 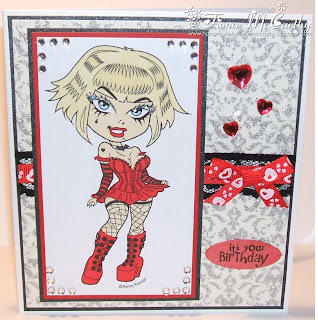 I have used a fab digi stamp from Kenny K(I think she looks quite a bit like Lady Gaga!) and coloured it with my ProMarkers. The glittery Bp is from Making Memories. 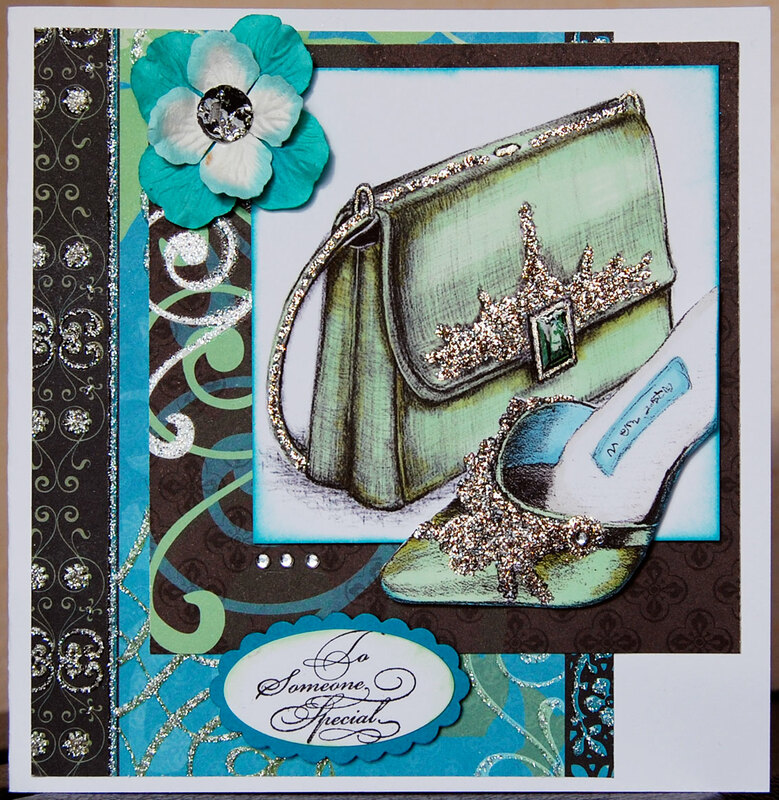 The card, lace and bling is all from my stash. Hope you like our crazy challenge and have fun! Please enter your link into Froggy so we can come visit you! Some still pictures for you! Castles!! How about Lavinia stamps or Tildas castle? Mesh, white, silver, bling bling, underwear cards! Wowwwwwww ladies what fantastic entries for the punches challenge! Thank You all for playing with us and showing varying ways of using your punches, beautiful! The winner of our candy pack drawn by Mr Froggy is... DARLING HO! Well Done chick, please email me your details to send the prize out. Onto our new challenge which is Cath's idea - THE SPOTLIGHT TECHNIQUE. The what what? The spotlight technique is really really easy, effective and quick, think of all those last minute xmas cards you'll be doing and remember this one. Firstly you stamp your image in black and white twice. Colour one of them in then choose portions of that and cut out and mount over your black and white image. You can choose to do spotlight or reverse spotlight which is to use the coloured version in full and spotlight the black and white one as Lin and I have done. To save time cut out your portions (They can be any shape you like) and only colour that bit in rather than the whole image. They make stunning christmas cards so roll your sleeves up and have a bash at it! As always the challenges run for 2 weeks. You still have another week to enter our Birthday challenge here! The Spotlight challenge will end on 30th August so lots of time to play. Remember though its a maximum of 3 entries per challenge and yes it can be 3 cards. Lets have a look at the work the fabulous DT have created for this. Some have never tried the technique before either so you can see how easy it is and how effective the designs look. I've taken an image from Dover Books Arts and Crafts collection - a CD ROM of digital images which are permission-free. When I spotted it, it seemed ideal for a digital spotlight technique! I cut a circular section from the image and coloured it using a range of blues and oranges in Photoshop Elements. I then applied a pale wash of the blue over the whole image and printed that, and several copies of the full-colour section. The backing paper uses the same image, this time with a slightly darker blue colour, and tiles a small section of the whole. 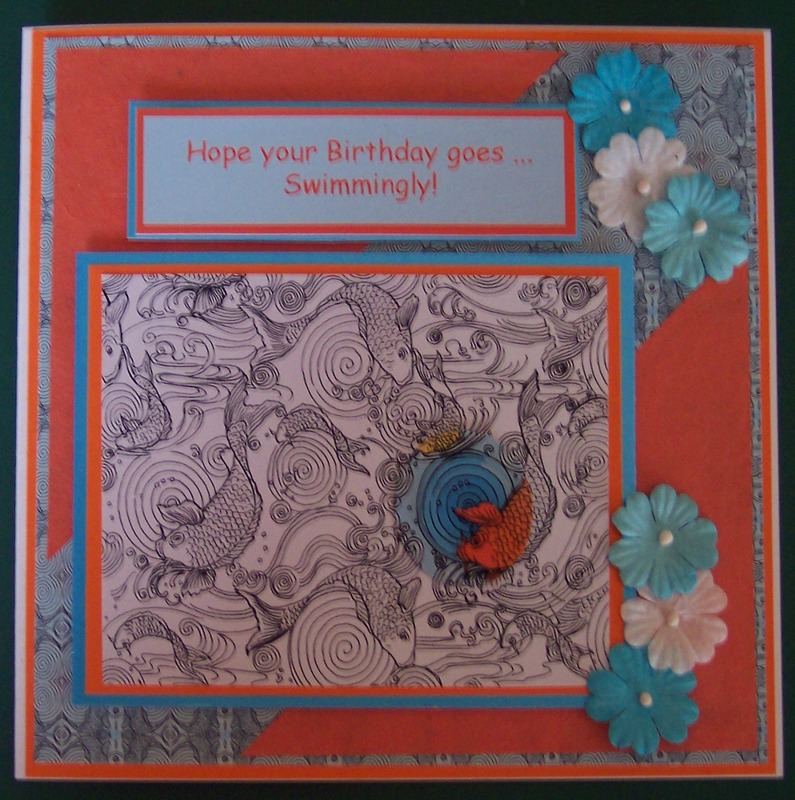 I assembled the card using three consecutively smaller sections of the coloured area and finished it with a digital sentiment, some orange paper and flowers. Like Josephine - I've gone for digi but totally differently as mine is all digi and all the elements are my own creation. 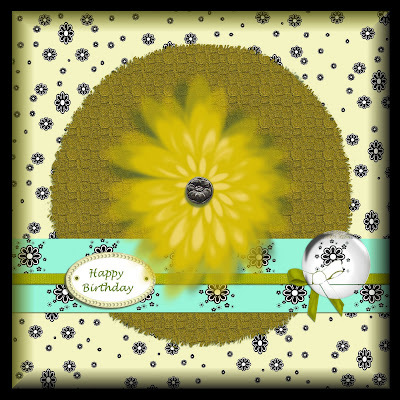 My paper-kit ribbon, bow, tag and flowers are all from my 'DitzyDaisies' digi kit and I've made the spotlight with my 'glass bubble' element, romoving the colour from 'behind' it. I could print it all and manually put it together (..hybrid..) too but I've chosen to go digital this week! 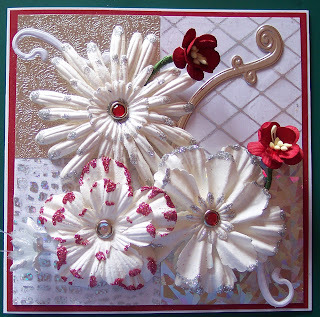 Papers by Creata, flowers Wild Orchid Crafts, fab image by HopeJacare (inspired by a photo taken by yours truly...!) coloured with Copics. I decided I preferred a Reverse Spotlight technique as I really wanted more of my dragon coloured than not. 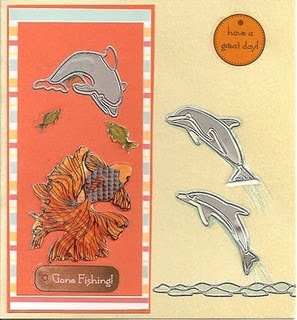 He is from an Elusive Images stamp sheet, as is the quirky little sentiment. I coloured him in with prismas and OMS. The bp came as part of the pack when I joined the Graphicus Guild and the background mat is from DCWV. I didn't have a knight stamp, nor could I find a suitable digi, so I downloaded a clip art knight, ready coloured, and shrunk him down, printed him and then added my dragon. It was just luck that he looks like St. George with the English Flag as his shield. He looks a little 'solid' for my liking, buy hey no, needs must. Now I need to find a decent knight stamp from somewhere, as I think this would make quite a good blokey card. This was a real challenge this week for me! I had no idea where to start but after the other DT's found some great inspiration I knew i could give it ago! I used my new papermaina papers and layered them on some dark green card and used the papermania stamp that came with the Goody bag a few months back. Stamped the image twice colouring one with my promarkers and leaving the other plain. Then took my nesties and cut out the circles layered with the same dark green and finished with a butterfly and a sentiment. This is an easy one to do. Just stamp the image (Stampendous) and the Greeting (SU) in Versafine Onyx black, then clear emboss. Ink up stamp again and place a jigsaw piece (gessoed if patterned) on the inked stamp in the part of the image you want to spotlight. Clear emboss. Colour the parts of the image on the jigsaw piece (I used Distress inks in Spun Sugar, Victorian Rose, Dried Marigold, Barn Door), outline with black marker, then attach to the image where it belongs. 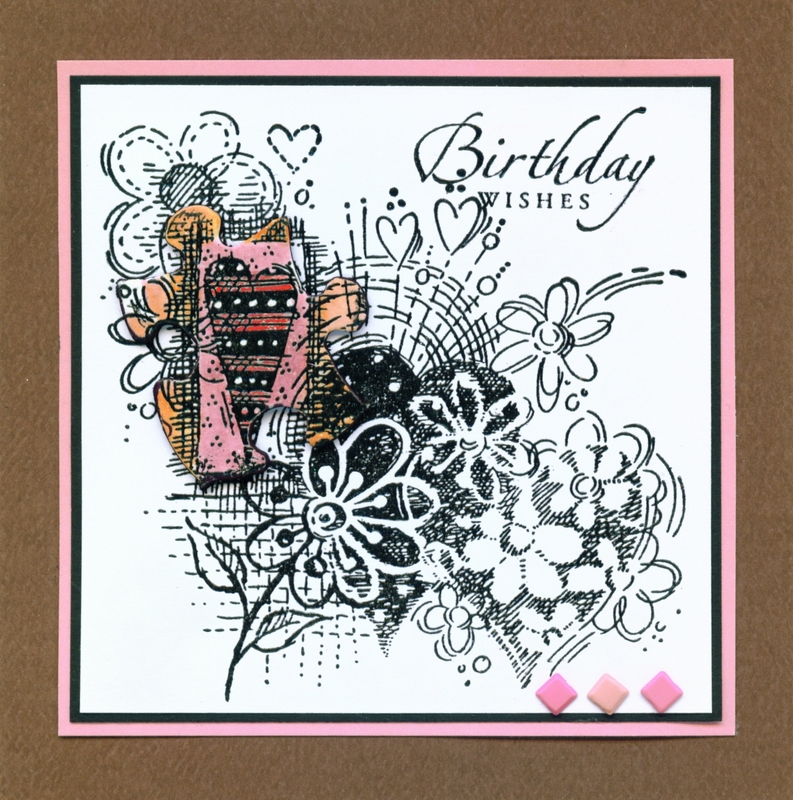 Add three toning brads in bottom right hand corner, then mount first onto toning pink card, then onto a folded brown card. I too went for the reverse spotlight route and stamped and embossed two images (stampscapes palms with huts large) and watercoloured one with starburst stains in winter jasmine gold, peony scarlet red, red hot poker orange, hydrangea blue and moonshadow ink tawny turquoise on the huts. I cut out 2 circles from the black and white version, added 3d gloss then placed over coloured image, matted and layered, simples! I have this great sentiment stamp that says 'You are unique' and it gave me my idea for my Spotlight card this week. I stamped the Penny Black animals in black ink then coloured one of them in and highlighted it with a circle frame. 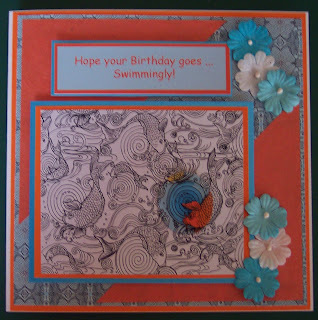 The punch I've used is Scallop Dot from Martha Steward and the DP is from Papermania Veneian Skies. I knew straight away that this gorgeous Penny Black image would be perfect for this challenge. I stamped it in Memento Tuxedo Black and then stamped it again and cut out one flower and a black circle with nesties. I coloured the single flower with Promarkers added some stickles and stuck onto the main image as a "spotlight." The script paper and the image are edged with Black Soot Distress Ink. The papers are DCWV and MME. 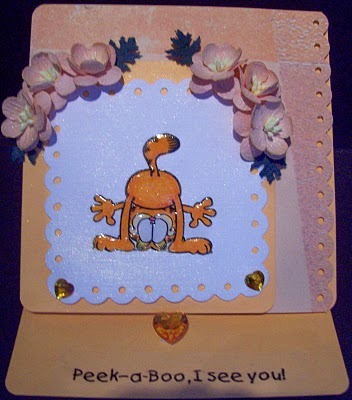 I finished the card with card candy and a sentiment from Craftwork Cards, some jewels and ribbon. Sorry I'm a bit behind with these so I shall put them all together to catch up! Firstly I shall do CHALLENGE 25 - PHOTO INSPRATION which had some beeeeeautiful entries, thank you! Well Done Ladies, please grab your Top 5 blinkie above! The winner is.... Glennis - Creating Cards. Well Done Glennis! Please email me to claim your prize! Woweeee well done ladies!! Please grab your top 5 blinkie above, well deserved as they were both tricky challenges! Challenge 27 - Its Our Birthday! !